olive and ollie: Accuquilt GO! 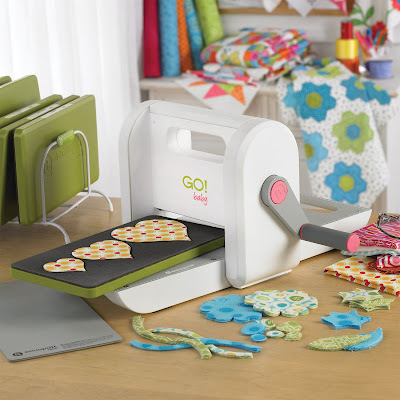 Baby Fabric Cutter Giveaway!!! Accuquilt GO! 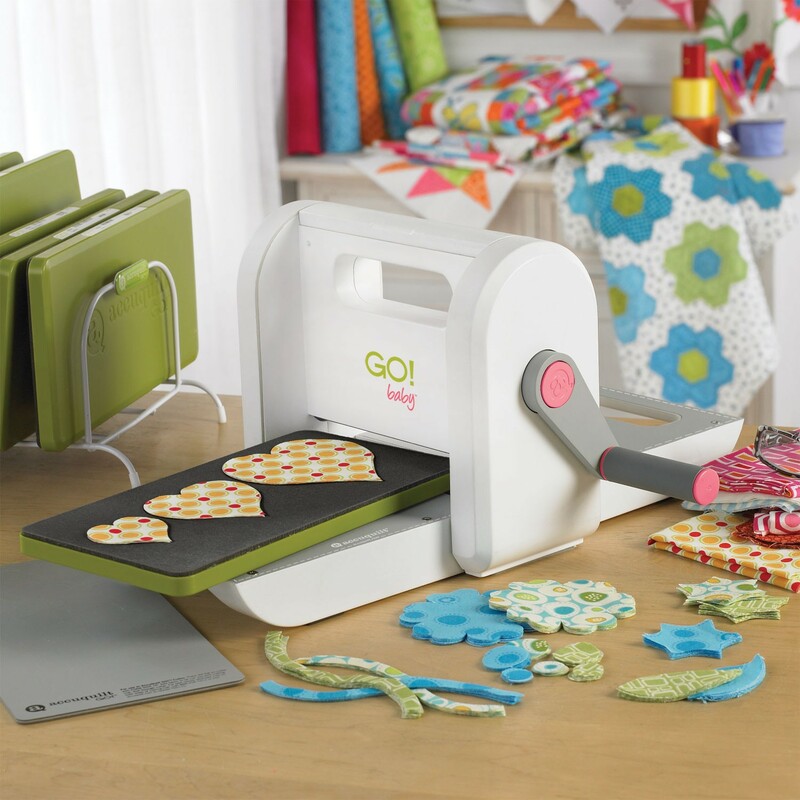 Baby Fabric Cutter Giveaway!!! Do you remember when I said that December was going to be a happy month? Well, here's one reason why: a chance for you to win your very own Accuquilt Go! Baby! Fabric Cutter! Sounds good, right?! And it's just in time for the holidays, so wouldn't it make a nice early gift for yourself? The great folks at Accuquilt have generously agreed to give one of my readers a GO! Baby Fabric Cutter, plus his or her choice of three dies. There are so many dies to choose from for the system, and I honestly had a hard time picking just three! One of the ones I did pick out was the 3 1/2" tumblers which I recently used to make a scrappy sewing machine cover. Be sure to check out my tutorial with step by step instructions if you'd like to make your own. But whatever dies you choose, you can't go wrong because the Go! Baby! makes cutting a breeze. So, let's get on with the giveaway, shall we? **Head on over to Accuquilt's site and check out all of the different dies that are available for the GO! Baby Fabric Cutter. Then, come back here to this post and leave a comment telling me what three dies you would choose. **Followers of my blog will receive an additional entry. If you're a follower of my blog, please leave a second comment telling me that you are. New followers are welcome, as well! The giveaway will be open until Wednesday, December 14th at 5:00 pm ET. I'll use the random number generator to choose one winner. The giveaway is open to US residents only, and please make sure your email address is either in your comment or a part of your blogger profile. I'll announce the winner here and then notify you by email. 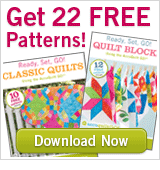 And don't forget that you can also get 22 free patterns from Accuquilt just by signing up for Accuquilt emails. For your free patterns, click on the photo below which will take you to Accuquilt's site; enter your information, and that's it! Good luck, and happy December! Of course I'm a follower!!! I love this place. I've been wanting one of these babies for a very long time! I'd choose the circles, the hexagons, and the tumblers. Thank you for a chance to win! I'm a follower! (using Google Reader). Ho Ho Ho, what a great present if I win. I would love the tumbler die, 5.25 square and one of the strip cutting dies. I am a new follower. Thanks for hosting such a great giveaway! Word gets round! Gotta get a GO! I am feeling lucky on this one... I am a follower of your blog.. thanks for hosting this great giveaway! I follow your blog and love it! Keep up the good work. I would get the Rose of Sharon, because I really want to do that quilt one of these days, and the Drunkards's Path and Diamonds, because I hate cutting those 2 shapes. I'd like drunkards path, circles, and hexagons. Sweet giveaway. Thanks so much for the give-a-way Heather and Accuquilt! Oh I am also a follower! My fave dies are the bird, double wedding ring and the drunkard's path. This is a hard decision to make but I think the Circles, Ribbon Twist, and the Winding Ways would be good choices. And yes, I am a new follower, using the Google Reader. I would choose the following: sparkle diamonds, tumbler and drunkard's path. And, although I thought I was a follower, I wasn't, until now! I would pick the daisy, stems and leaves and the birds (plural) dies. So much fun! I would love to have one of these. I can sew perfectly but because of my trembly hand cutting is a chore. I'd choose 3 of the simplest cutters and enjoy to my hearts content. Thank you for a chance to win. Geesh! Forgot to leave my numbers. ohh Heather, i would choose,drunkard path, go value, and go quarter square. keeping my fingers crossed !! Ooooh yum! I'd choose the Hexagons, the Value die and the drunkard's path! And I'm a follower! I'd choose the Hexagons, the Value die and the drunkard's path! I love applique, and I just love looking at their different shapes! My 3 favorites are the rose of sharon, the funky flowers and the round flower! I am a follower and would love to win one of these. enjoy your blog. thanks. Wow, this is amazing, and these look so much fun! I'd love the Sunbonnet Sue for sure, I just love her! I'd also pick the birds and the gingham dog. These seem the most fun to me! Thank you! The dies I would choose are drunkard's path, equilateral triangle and circles. Thanks for the chance to win! Rag squares, signature block, and chisels! Great giveaway, thanks!! I'm a new follower. I am enjoying looking around. If I were to win, I would choose rick rack, tumblers and drunkards path. Thanks for the chance. Tumblers, strips and squares. Dont know which sizes yet! Thanks for this chance! Awesome giveaway! Saw a demo yesterday and was in love! I would want the scrappy flower, the Go Bird and the Go Ric Rac. Oh how wonderful!! I've heard so many great things about Accuquilt and I'd love to have one of my own. I'd choose: Rose of Sharon, Drunkard's Path and the Apple Core. Thank you and Accuquilt for a great giveaway and a chance to win. I'm already a follower of your blog. Thank you! Hmmm, I think I'd select the Tumbler, Sparkle-Diamonds, and the Apple Core. Too many good dies, that was tough! If I was the lucky winner I'd love to choose the Funky Flowers, the Hexagon and the Rose of Sharon. Thank you for a great giveaway! I'm a new follower of your blog. Thanks for a chance to win. I'd pick the circles (2/3/5"), hexagons (2/3/5"), and the 6.5" tumbler. Thanks for the chance! If I was the lucky winner, I would pick the drunkard's path, the hexagons and the tumbler. All three are wonderful to use and miserable to cut out in any quantity. Thanks for a chance! I already follow your blog. Thanks for the giveaway. Ooh parallelagram, hexagons, and circles! I'd choose... circle, drunkard's path and the five-point star dies. Great giveaway! Thank you! And I'm a faithful follower. I adore your quilts! I think I'd pick the 2.5" strip cutter, the hexagons and probably the 5" square. I would love to try the 2" squares, circles, and hexagons. I'd get the Drunkard's path, the tumbler block and an HST. I follow you on my RSS feed! I would love to win one of these!! I'd choose the drunkard's path, sparkle diamonds, and tumbler dies. Thank you for a chance!! There are a lot of good dies that I would love to have, but I think I would choose the drunkard's path, the circle die, and the hexies. Thanks for the chance to win! I am also a new follower coming over from Craft Buds. I love your blog! Hi! I'd love the apple core, tumbler and hexagon dies. Thanks for the chance to win! Hi again! I'm a new follower! Thanks! You're going to have so many comments to sort through - everyone wants an accuquilt go! If I win, I'll choose the tumbler, hexagon, and circle. I'm a follower of your blog too!! Yay for two entries! I would choose: Go, Birds!, Go! Rose of Sharon, and Go! Hexagon! I would love to have the GO Birds, Rick Rack and Calico Cat. I would choose the Rick Rack, Hexagon and Drunkards Path dies. So, I know I'm really lame, but what I want, what I really, really want, is a die to cut my 2.5" strips for me. Lame, right? Oh, wait, they have that? Awesome! Also, the 1" and 4" HST dies would be a godsend! Follow you cuz you ROCK Heather!! I would keep it simple...half square triangles, hexies, and squares. Great giveaway! Yay! I'd love the Drunkard's Path, some quarter triangles and some half square triangles (hellooo flying geese!) Thanks for the chance to win, Heather! I would love the small rag die, the birds die and the round flower die. Thanks for the chance! following your blog in google reader. thanks for sharing this beauty!! call me boring, but i'd have to start with the practical dies. so i'd probably go with the circle pack (2", 3", 5"), the hexies pack (2", 3", 5"), and 2.5" strip set. but i'd love to add on some cute applique shapes after i got the hang of it! this would seriously make my Christmas. thanks for the chance to win! Three dies - my faves are the rick rack, rose of sharon, and either the chisel or the birds die. I would love the stems & leaves, holiday accessories and the Rag heart & star. This would be such a fun Christmas present! I'd choose some simple ones--the circles, the hexagons, and the value die. Thanks for the chance to win! I am very new to quilting - an heirloom sewer at heart! So, I would start with the basics, square, triangle, strip. But that reindeer looks might cute too! i would choose the apple core, tumbler and circle dies. thanks! I am a follower of your blog also! Great use of that tumbler die! I am following you're blog and subscribed too! If I won I would like Birds, Chisels and 2 1/2" strips. I like the circles, 3" HSTs, and the birds... :) Thanks for the giveaway! sweet! this machine & dies are on my Wish List!! I love 3" HST, rag flower & circle and drunkard's path. thanks for the chance to win! I just subscribed via email - thanks! Wow, what a great giveaway! Rick rack, circles and tumblers. Oh to win would be awesome. I would choose go birds, go hearts and go circles. I would choose the hexagons, 2.5" strips and the tumblers. Thanks for the chance to win! I am a follower! I would also choose the tumbler, apple core and drunkard's path dies. Hmmm, 3 favorites would be Daisy, Round Flower, & Hexagon. What a great giveaway. If I am SO LUCKY to win the Go! Baby, I'd choose the Fall Medley, the Holiday Medley and the Value die. Thanks for the wonderful Giveaway ! I am also a new follower ! I'd love the hexagon dies, circles and the rick rack - those things that are very tricky to do by hand! I'd choose 3 Christmas die cuts & get busy on some gifts!!! I follow you everyday!!! Fun to see what you are up to!!! I follow your blog. Thanks for the give away! I'd choose the hexagon, daisy and apple core. Thanks for the give away! I'd choose the hexagons, circles, and snowflakes... I think... so many great dies to choose from! I'm following now - thanks for the chance to win! Hi, Heather! Yay! I'm definitely a follower, addict and almost meet stalker criteria of your blog! I would choose the tumbler, hexagon and rick rack dies! Thanks so much! YES, YES of course I am a follower! I'm new to quilting and your blog but so happy I found it!! I am a new quilter and just found your blog and so happy I did! I am a new follower- glad to have found you! I would pick the 3 1/4 swuare. the Go! Birds and the Go! Diamonds. Hello, brand new follower here. I came visiting from Quilt Dad. I wouldn't mind the Go! Hexagon-2", 3", 5"
I'd love to win the Go! Hexagon-2", 3", 5"
Let's see. Picking just 3 dies is HARD! Gosh! I'd have to say that I'd have to pick the Sparkle Diamonds, the 2", 3" & 5" Hexagon set and the Drunkard's Path as my 3 die choices. If I won I'd choose the 5.25" rag square, 4" quarter square triangles, and the 3" triangles in squares. I would pick the go Go circles, the Go hexagons, and the Go tumbler. Those are all shapes that are hard to freehand or use templates with! Thank you for the great giveaway. I am a new follower via Google reader. Thank you so much. I would pick the apple core, fall medley and circle. My dies of choice would be the Double Wedding Ring, Drunkard's Path 7" and the Go Circle 6". Thanks for the chance! I'm a follower, too. Happy Holidays! Heather, I love the birds, the sparkling diamonds, and the regular diamonds. This would be the best Christmas gift I could receive apart from world peace and several million for the food bank. i'd definitely choose the tumbler, circle, and hexagon dies! I've been a follower, now following by e-mail as well! If I win, I would choose the Parallegram, the Rick Rack, and Rose of Sharon dies. I am already a follower. Using Google reader. Apple core 6 1/4, drunkards path 3 1/2 tumbler 3 1/2, there are so many great ones. Birds, airplanes, and critters were my favorites! I came here to check on your binding tutorial . .and was happily surprised to see the giveaway. Of course any of the triangles. . someday I'm going to conquer the pinwheels I love so much! Rectangle 3 1/2" x 6 1/2"
Thanks for offering this chance!